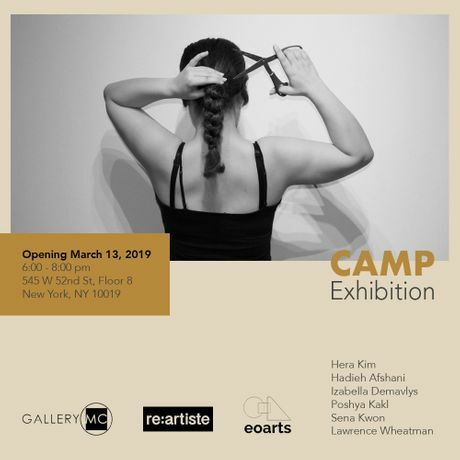 RE: ARTISTE International Art Organization and The Espejo Organization for the Arts (EOarts) will present “CAMP”, an exhibition of works made by male and female artists that explores women’s chosen and forced isolation. Programmed to open during Women’s History Month, the show will showcase the works of national and international artists Hera Kim, Hadieh Afshani, Izabella Demavlys, Poshya Kakl, Sena Kwon, and Lawrence Wheatman. “When we think about the word ‘camp’ we picture an isolated territory. We wanted to take this concept - literally and metaphorically - to refer to women’s voluntarily or forcefully placement in their personal lives and in their social setting,” explains RE:ARTISTE Director Natalie Burlutskaya. The exhibition, that is a continuation of the project “The Female Power” started by Burtluskaya four years ago to highlight the role of women of various professions and occupations, is a collaboration with EOarts to promote the works of international emerging and mid-career artists. The show will showcase multimedia pieces that will mix psychological states of denial, restriction, memories, love and also will pose questions about issues on immigration, religion, war, and illness. The one-night event on March 13 will host artist talks and the discussion with the guests.